Isn’t it always the way, you just settle in and then suddenly ‘Hey! We’re moving!’ (I promise I will update you on this soon!) …And it just so happened that my vegetable garden was flourishing – beans, cherry tomatoes, celery, lettuce, parsley, the list goes on. We ate a lot and gave a lot away, but what to do with the dozens of beautiful, large, unripe tomatoes that smothered our very big tomato plant? We hadn’t even had a chance to try them yet! 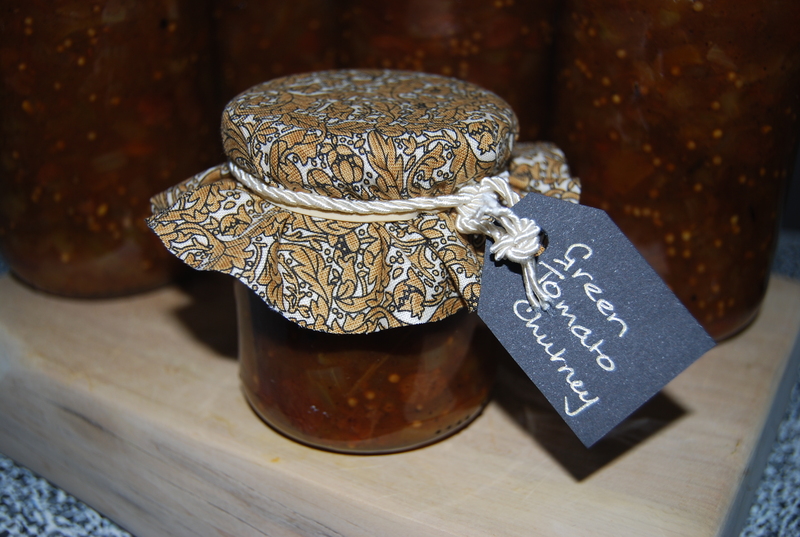 As always, mum came to the rescue with a fab recipe (below) for green tomato chutney. In between sorting and packing and showing people through the house, we somehow managed to whip this up (I’m not quite sure how). So now we’ve been able to bring our tomatoes with us and will be able to enjoy them with our meals throughout the winter. Combine all the ingredients in a large saucepan and bring to the boil, stirring, until the sugar is dissolved. Cook very gently, uncovered, for 1.5-2 hours, until the liquid has evaporated and the tomatoes have pulped. Pour the chutney into hot, clean jars and seal. It is best left for 2 months before using.